Mani Nere forum | "Arti delle Mani Nere" for African Arts' Scholars, Connoisseurs and Collectors. The nkisi is essentially constituted by a container and a content. When, as in this case, it has anthropomorphic shape, the figure shows front attitude, open mouth and eyes marked by inserts of different material (metal, shell and often glass), that make the look “white”, far, sometimes anguished. 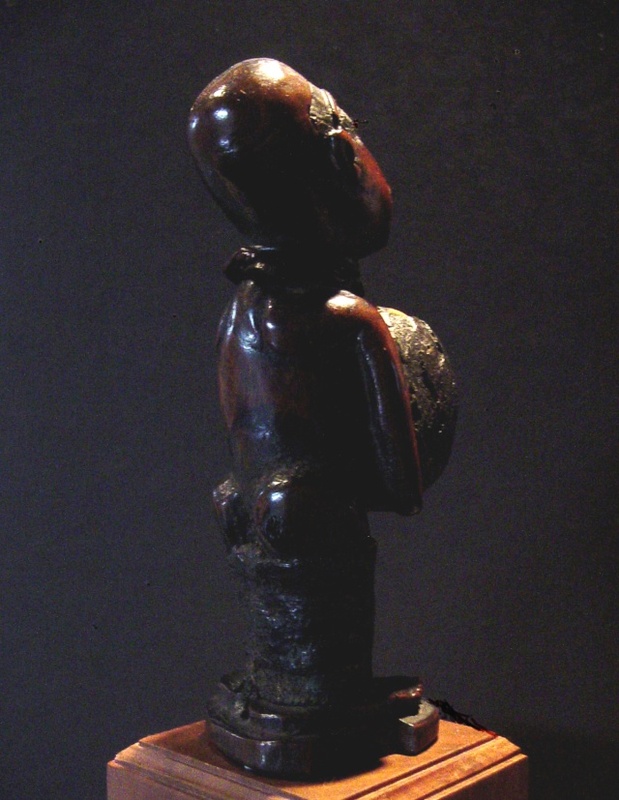 The content (called Bilongo), in this case placed in a cavity on the chest of the figure, covered with resin and closed by a warthog’s tooth – is the “medicine” – storage of magic materials affixed not by the sculptor, but from who has made the consecration ceremony of the sculpture and activation the power of nkisi. 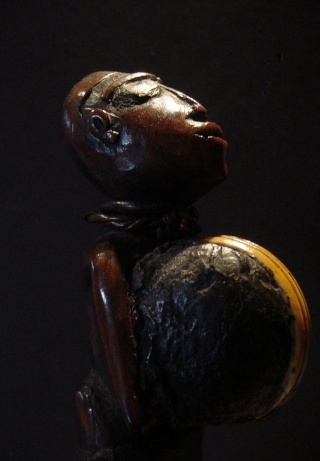 Each nkisi was considered effective in a particular domain of care or anti-witchcraft. 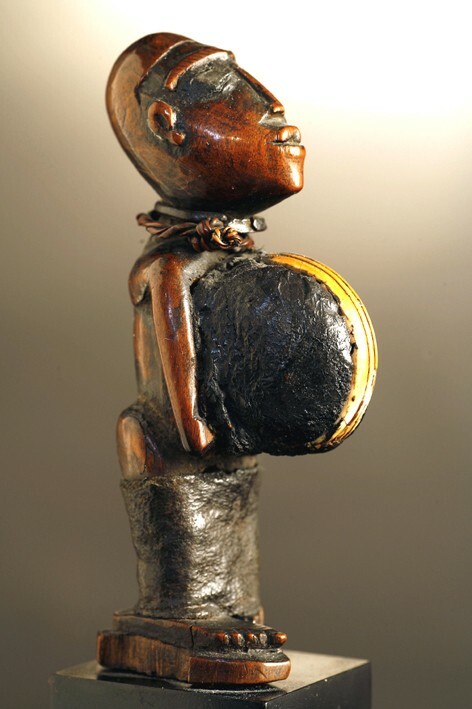 This small nkisi has excellent proportions and materials and able to express an attitude of proud and stubborn opposition to evil. 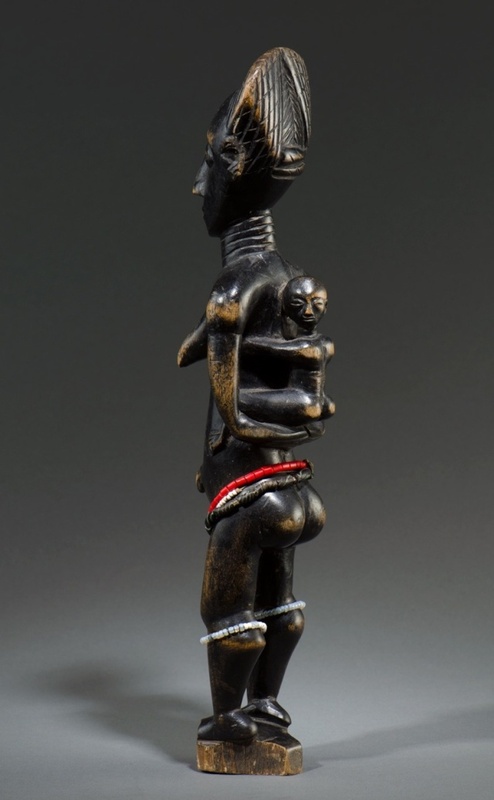 Although minute proportions, for quality of execution and condition of all materials used, is a figure of great artistic depth and evocative, worthy representative of the great sculptural tradition of the lower Congo blacksmiths. Lo nkisi è essenzialmente costituito da un contenitore e da un contenuto. Quando, come in questo caso, esso ha forma antropomorfa, la figura si presenta con atteggiamento frontale, la bocca aperta e gli occhi marcati da inserti di materiale di volta in volta diversi ( metallo, conchiglia e spesso vetro), che rendono lo sguardo ”bianco”, lontano, a volte inquietante. Normalmente la testa veniva scolpita con maggiore cura del resto del corpo dal momento che questo era destinato ad essere occultato. Il contenuto (bilongo), in questo caso collocato in una cavità sul torace della figura ricoperta di resina e chiusa da un dente di facocero, è la “medicina”, ammasso di materie magiche apposta non dallo scultore, ma da colui che ha compiuto la cerimonia della consacrazione della scultura e di attivazione del potere dello nkisi. Ogni nkisi era considerato efficace in un dominio particolare di cura o di lotta alla stregoneria. Questo piccolo nkisi ha proporzioni e materia eccellenti e riesce compiutamente ad esprimere un atteggiamento di fiera ed ostinata opposizione al male. Pur di minute proporzioni, infatti, per qualità esecutiva e compiutezza di conservazione di tutti i materiali impiegati, è una figura di grandissimo spessore artistico e di forte potere evocativo, degna rappresentante della grande tradizione scultorea dei fabbri del basso Congo. 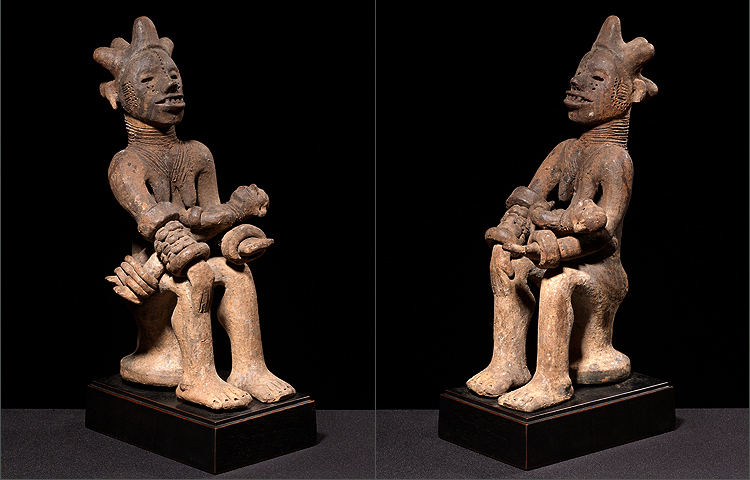 These ntekpe figures were originally part of a family shrine that honored one of the many Igbo deities. Most Igbo households would erect at least one such shrine, usually near the entrance to the Home. 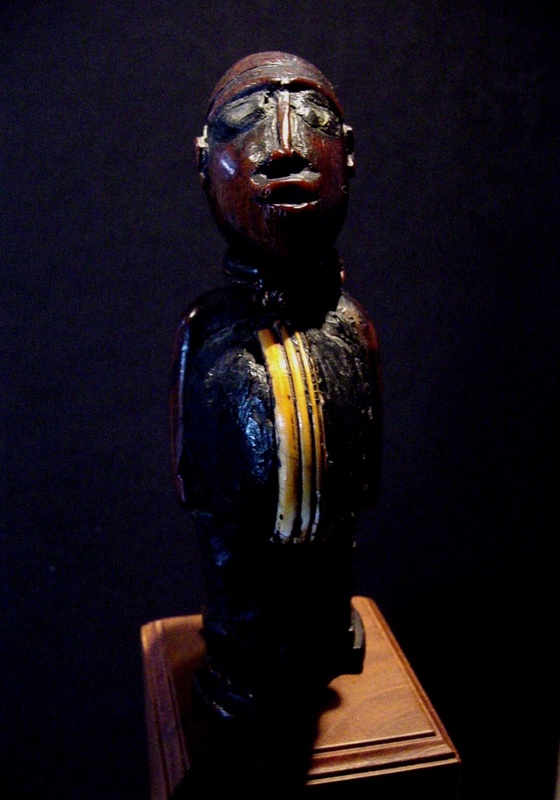 The ntekpe figures were considered “children of the shrine” and its deity. Their function was to protect the inhabitants of the house and to help when needed. “The shrines, and by extension their ceramic accoutrements, locate the indigenous deities and others imported from the Cross River, not far away to the east. They are placed at compound entrances, outside houses, in domestic gardens, as well as in small sheds of their own. 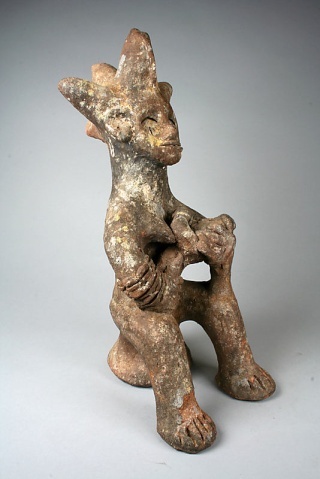 Not all contain ceramic bowls or sculpture, but many do-upon the request of the deity as revealed in divination; when present the terracotta figures, ntekpe, are considered “children” of the shrine and its deity, and are there to help and protect it.”( M. Cole, 1984). This terra cotta mother and child is exceedingly well done. The attention to detail is astounding. The mother sits proud with her elaborate coiffure and ringed neck; wearing large bangle and cowry bracelets. The child is also very detailed wearing anklets and bracelets, all symbols of wealth and importance. The surface is varied with traces of original pigments. Important to note is that there is no restoration with this object; this is rare for a terra cotta of this vintage. 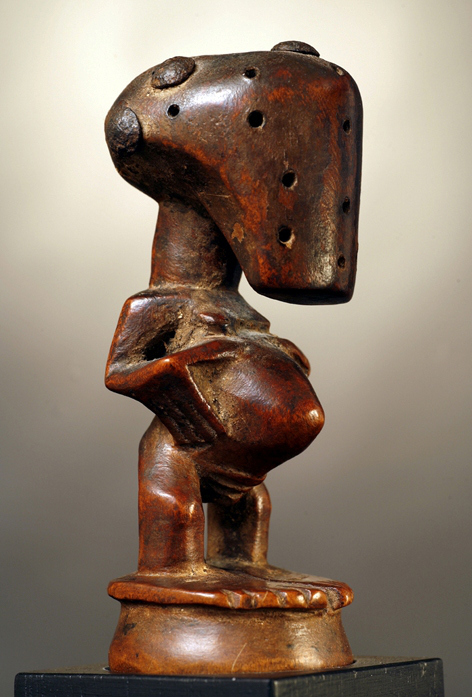 Balance and formal composition of the piece, combined with its touching expressiveness, make this sculpture one of the best example among the matenity Ntekpe known. 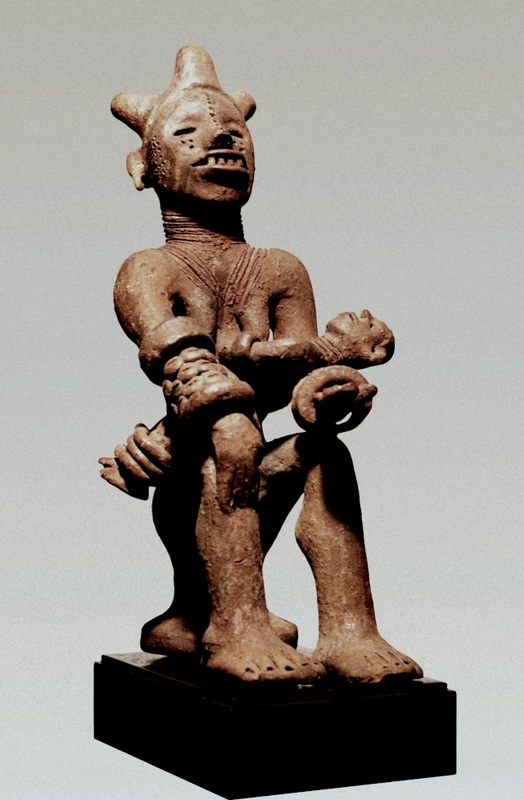 Le figure Ntekpe erano originalmente parte dell’altare di famiglia destinato ad onorare le divinità degli Igbo. La maggior parte delle famiglie Igbo erigevano almeno uno di questi altari, di solito vicino l’ingresso della casa. Le ntekpe erano considerate divinità in quanto “figli dell’altare”. La loro funzione era quella di proteggere gli abitanti della casa e dare loro aiuto quando necessario. Questa maternità in terracotta è estremamente ben fatta. L’attenzione al dettaglio è stupefacente. La madre si siede fiera esibendo la sua elaborata coiffure ed il collo ornato di anelli; le braccia sono ricoperte da grandi bracciali e braccialetti arrotolati. Il bambino, finemente modellato, indossa anch’esso cavigliere e bracciali, simboli di ricchezza ed elevato rango sociale. La superficie della scultura è variegata con tracce di pigmenti originali. Importante e raro è il fatto che, pur essendo una terracotta di vecchia produzione, non presenti alcun restauro. 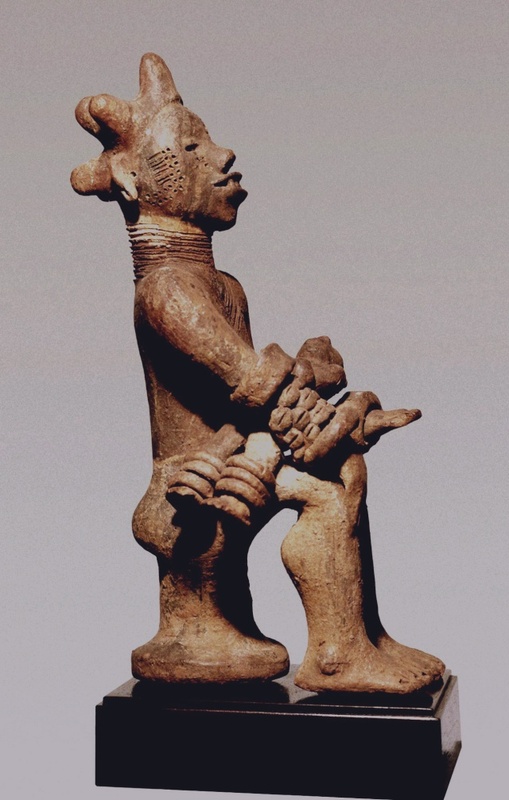 L’equilibrio e la compostezza formale di questo oggetto, uniti alla sua commovente espressività, rendono questa scultura uno degli esempi meglio riusciti tra le materità Ntekpe conosciute. -Burkhard Gottschalk,” Senoufo. Trésors inconnus des Collections privées, L’art du Continent noir. 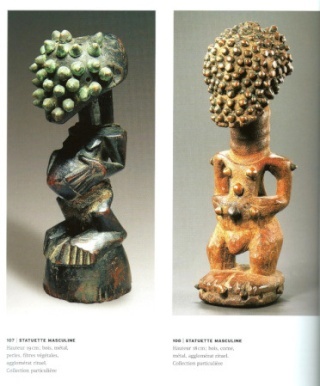 Afrique.Vol.3”, Verlag U. Gottschalk, Dusseldorf, 2009, pag 97, fig. color. 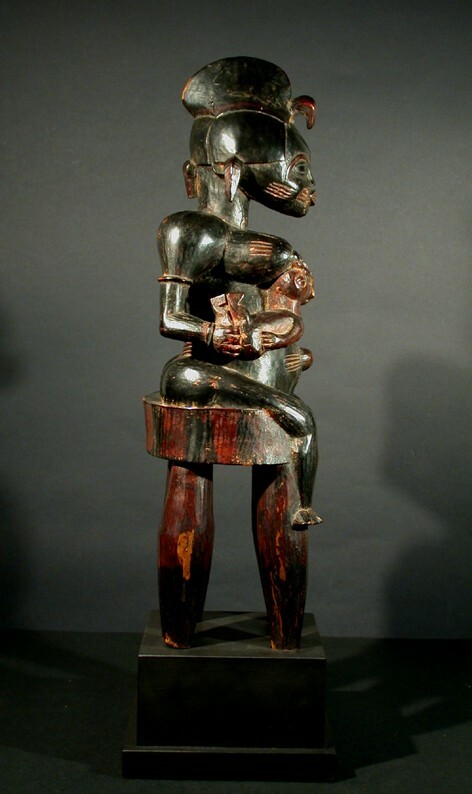 Long before Christian artists, africans were depicting women holding a child in their arms or breastfeeding to celebrate fertility and the harmony of the community-especially when infant mortality, the capturing of young adults for slavery and disease were endangering the group’s survival. 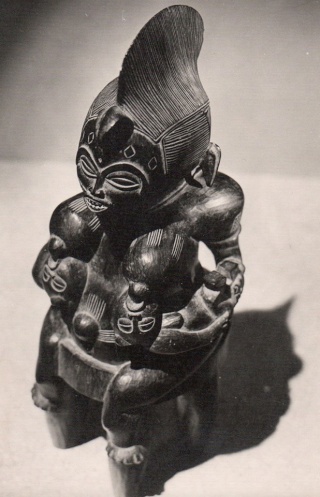 Maternity Figure, seated on a high four-legged stool and holding her two children to her breasts, with domed navel surrounded by radiating scarification, sharply projecting breasts with scarification, cylindrical neck, pointed teeth bared, cicatrice marks on the cheeks. The whole composition, emphasised by a strong verticality, converges on a beautiful head with extremely marked features, embellished by an elaborate coiffure. -Burkhard Gottschalk, “Senoufo. Trésors inconnus des Collections privées, L’art du Continent noir. Afrique.Vol.3”, Verlag U. Gottschalk, Dusseldorf, 2009, pag 97, fig. color. Molto prima degli artisti Cristiani, sono stati gli Africani a raffigurare l’immagine della donna con il bambino in grembo o durante l’ allattamento al seno, al fine di celebrare la fertilità e l’armonia della comunità, soprattutto quando la mortalità infantile, la cattura di giovani adulti per la schiavitù e le malattie minacciavano la sopravvivenza del gruppo. Figura di maternità seduta su un alto sgabello a quattro pioli che tiene i suoi due figli al seno, con ombelico a cupola circondato da scarificazioni che si irradiano intorno. Il seno, fortemente sporgente, ha anch’esso scarificazioni , collo cilindrico, denti scoperti, cicatrici sulle guance. Tutta la composizione, sottolineata da una forte verticalità, converge su una bella testa con caratteristiche estremamente marcate, impreziosita da un’elaborata coiffure. “La scultura è di un artista del Nord del quale sono conosciuti altri esemplari (Holas 1975:78,79). La figura ha tra le braccia due gemelli le cui bocche sono aperte sui capezzoli della madre che pare non stia allattando, ma trasmettendo la conoscenza. Appare difficile immaginare una madre primitiva nei panni di questa vigorosa figura dalla bocca sorridente. 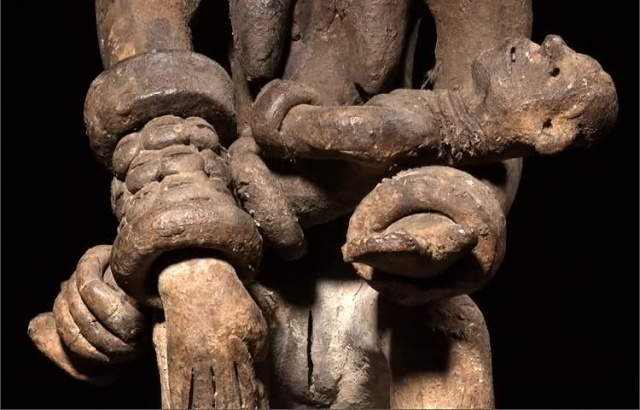 Le caratteristiche fisiognomiche della scultura sono tipiche di questa regione (Korhogo)”. – “L’Africa delle meraviglie – Arti africane nelle collezioni italiane”, Palazzo Ducale e Castello d’Albertis, 31th December 2010 – 5th June 2011. -Chantal Dandrieu e Fabrizio Giovagnoni, “Passione d’Africa. 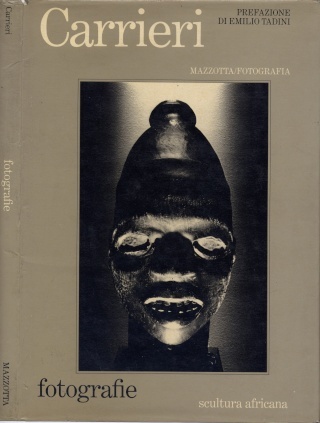 L’arte africana nelle collezioni italiane.” Milano, Officina Libraria ed., 2009, pag.137, fig. # 88, color. 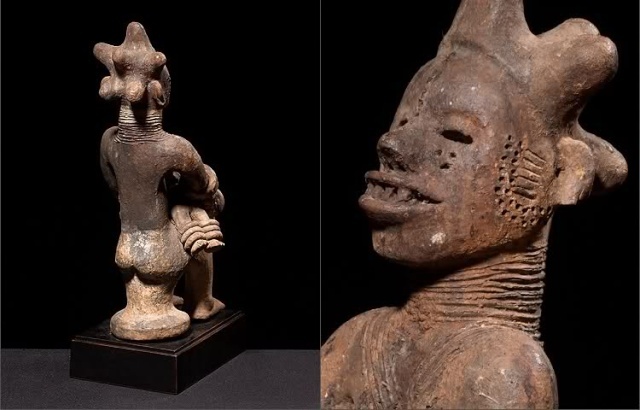 “It is throught that Ejagham, the ‘true’ Ekoi, one of the East Nigerian ethnic groups, were the first to have made skin-covered masks and had danced in them. 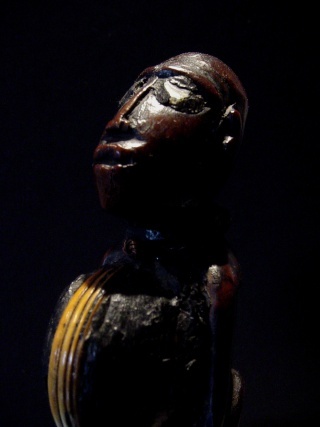 Ritual objects of this kind are not known anywhere else in Africa nor indeed in other parts of the world. Starting with the Ekoi this custom spread over the whole of the Great-River area, this is to say –from a region stretching from the river of this name in the West to the so called Cameroons Grass Lands. Both cultured areas have influenced each other strongly over a long period of time. They share similar tribal organizations and hence also mutual traditions in masks. The Ekoi are not alone in using skin-covered head-gear and masks for dancing: other tribes on both sides of the border between Nigeria and the Cameroons observe this custom. 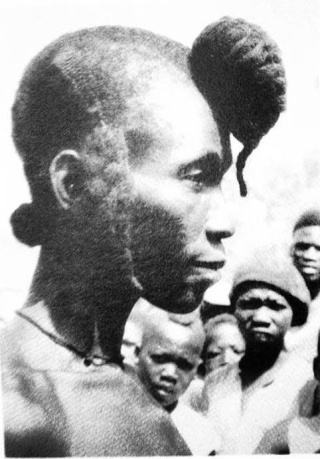 They are the tribes to the West and North West of the Ekoi: The Bende/Ibo and Ibibio; in the North and East: The Keaka, Anyang, Banyang, Widekum, and finally in the North: The Boki and related groups (Nicklin, 1979). What, in fact, gave rise to such masks and their use? Was it really the so-called ‘head hunting’ tradition according to which success in hunting had to be proved? It is a fact that some of these mask-wearing societies like the nkwa-mbuk of the Etung/Ekoi and the nkang of the Boki practiced human sacrifice and hunted for heads ( Nicklin, 1977). P.A.Talbot who had lived in the Cross River region at the beginning of this century reports as late as in 1912: “Thank God, now-a-days wooden masks covered by leather are worn instead of heads of newly slain enemies as was done in the past by the winning side” (Talbot, 1912). 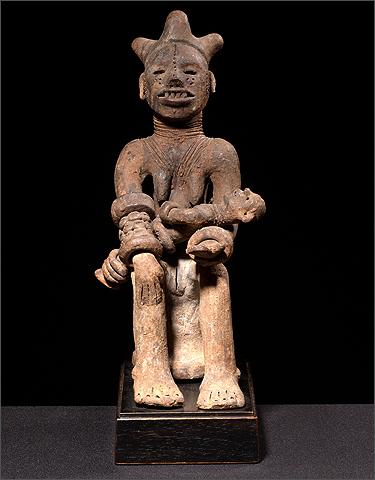 This Anyang/Ekoi headdress on a basketry base, carved in wood and covered entirely in leather, in the form of a human head with naturalistic features with open lozenge mouth, with full lips and showing metal teeth, the eyes cut revealing the wooden core, with painted pupils; large ears, surmounted by a conical cap. The pride and expressive composure of the headdress makes it an icon of Ekoi sculpture. This head expresses at the highest level the aesthetic culture of this people without the use of excessive and grotesque elements that are often found in other headdress. -“L’Africa delle meraviglie – Arti africane nelle collezioni italiane”, Palazzo Ducale e Castello d’Albertis, 31 Dicembre 2010/5 Giugno 2011. -Chantal Dandrieu e Fabrizio Giovagnoni, “Passione d’Africa.L’arte africana nelle collezioni italiane.” Milano, Officina Libraria ed., 2009, pag.137, fig. # 88, color. Gli Ekoi, noti anche come Ejagham, sono un gruppo etnico dell’estremo sud-est della Nigeria che si espande anche verso est, nel nord del Camerun. “Gli Ekoi/Ejagham (Nigeria sud/orientale), sono stati i primi ad aver realizzato maschere/copricapo rivestiti di pelle ed aver danzato con essi dopo averli indossati. Oggetti rituali di questa tipologia non sono noti in Africa, se non nelle realtà viciniori, e neppure in altre parti del mondo. Gli Ekoi sono stanziati nella vasta regione del Cross River, lungo tutto il fiume fino ad occidente nelle terre del Camerun denominate Grassland, con le cui popolazioni erano fiorenti gli scambi che hanno influenzato reciprocamente le due regioni, nigeriana e camerunense. Gli Ekoi non sono i soli ad utilizzare copricapi e maschere ricoperti di pelle per la danza: altri gruppi etnici su entrambi i lati del confine tra la Nigeria e il Camerun, hanno questa usanza. A nord/est degli Ekoi, i Bende / Ibo-Ibibio; a nord /ovest, i Keaka, gli Anyang,i Banyang ed i Widekum, e infine a Nord, i Boki ed altri gruppi affini (Nicklin, 1979). Cosa ha dato luogo a tali maschere ed al loro uso? E’ stata davvero la tradizione del cosiddetto ‘head hunting’, secondo cui il successo in battaglia doveva essere confermato dalle teste tagliate dei nemici? E’ un dato di fatto che alcune società che utilizzavano maschere similari, come la nkwa-mbuk degli Etung e la nkang dei Boki, praticavano sacrifici umani ed erano cacciatori di teste (Nicklin, 1977). P.A.Talbot, che ha vissuto nella regione del Cross River all’inizio di questo secolo, scrive: “Grazie a Dio, oggi sono soltanto maschere di legno rivestite di pelle ad essere indossate in sostitizione delle teste mozzate dei nemici uccisi, come è stato fatto in passato da parte dei vincitori” (Talbot, 1912). Questa maschera/copricapo Anyang/Ekoi ha una base di vimini ed è scolpita in legno, rivestita esternamente di pelle, ha la foggia di una testa umana con aspetti naturalistici, la bocca aperta, labbra carnose e denti di metallo in evidenza; gli occhi ritagliati nella pelle rivelando il nucleo di legno, hanno le pupille dipinte; le grandi orecchie, infine, sono sormontate da una calotta di foggia conica. La fiera ed espressiva compostezza della scultura la rende un’icona della scultorea Ekoi. Questa testa esprime al miglior livello la cultura etno/estetica del popolo Ekoi, senza l’utilizzo di quegli elementi grotteschi ed eccessivi che sovente sono riscontrabili in altri copricapi. L’Africa delle Meraviglie. Arti Africane nelle collezioni italiane. Musée Palazzo Ducale, Genova, 31 décembre 2010 – 5 juin 2011. -Private correspondence Willy Mestach/ Elio Revera, Bruxelles. “Dans la zone septetrionale du pays songye, d’ouest en est, du sud au nord, les sculptures se distinguent par la moltiplication des clous à la tête ronde. Cette pratique semble s’être développée surtout dans le nord-ouest de la province du Lomami. La présence des clous en lation sur le visage a donné lieu à diverses interprétations. Ces points pourraient se référer aux épidémie diverses que von Wissmann avait déjà constatées lors de son second voyage chez les Songye.. The Songye peoples have made numerous propitiatory objects against the smallpox. 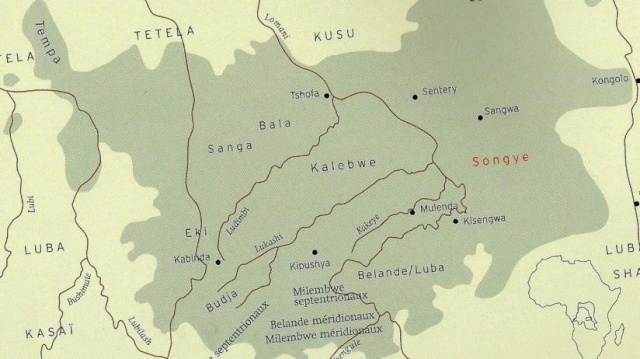 The Songye territory, in fact, was devastated by this epidemic in the late ‘800 and early’ 900 and of course the tragedy also affected the neighboring population. How has this influenced the creation of many protection fetishes it is difficult to imagine it: the fact is that it is among the Songye which are found numerous minkisi realized for protection of smallpox. Il popolo Songye ha realizzato numerosi oggetti propiziatori per combattere la malattia del vaiolo. Le terre Songye infatti furono devastate da questa epidemia tra la fine dell’800 ed i primi del ‘900 e naturalmente la tragedia interessò anche le popolazioni limitrofe. Come ci ricorda Cyrille van Overbergh nel suo lavoro Les Basonge del 1908, i Songye pur essendo uno dei popoli più sani del Congo, furono interessati dall’epidemia, sebbene il numero dei decessi tra questa gente fu inferiore a quello registrato tra le etnie viciniori. Come poi abbia influito sul diffondersi della malattia la realizzazione dei numerosi feticci di protezione è difficile immaginarlo: fatto sta, in ogni caso, che è comunque proprio tra i Songye che si riscontrano numerosi minkisi di siffatta tipologia utilizzati, molto probabilmente, contro l’epidemia del vaiolo. Wood with black patina, beads. This Agni sculpture represents a maternity figure. In Agni culture the spirits world is very important: statues and other sculptures are able to communicate with them. This maternity was probably carved to thank a birth. It distinguishes itself by a high coif very finely carved and a black patina which reflects its age. It still has its old beads that were the symbol of beauty in Agni tribe. 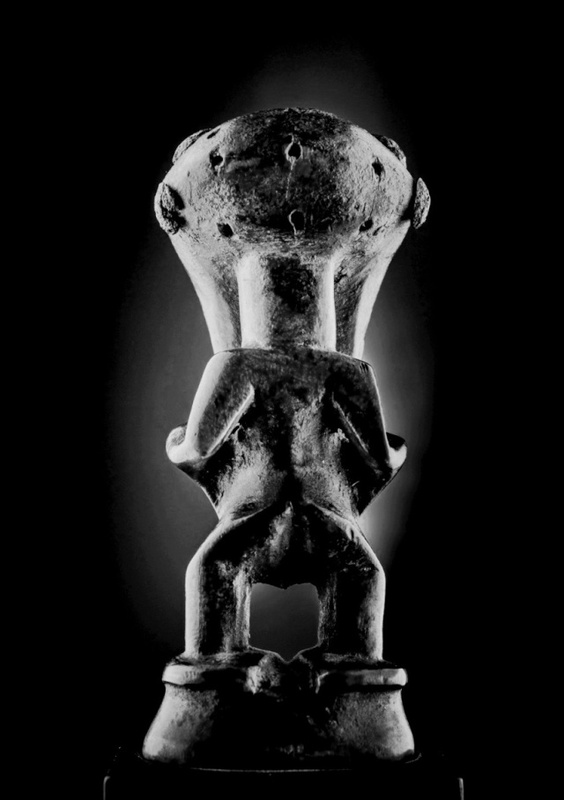 The figure’s face is charming, dignified and proud, reminiscent of the memorial clay heads used in funeral rites, as well as the volumes of the slender body and hooked navel (almost a reference to the umbilical cord). In contrast, the figure placed on the back – a child in the features but man in his bearing – held outside his gaze. All in a quiet dynamism. 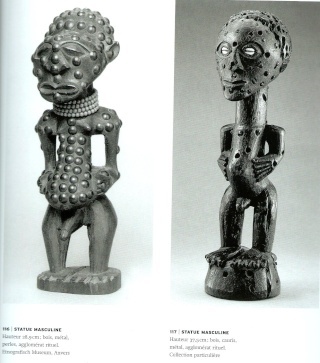 – BACQUART Jean-Baptiste, The Tribal Arts of Africa, Thames&Hudson, London, 1998. – RIVIÈRE Marceau, Arts Premiers de Côte d’Ivoire, Saint-Maur, 1997. 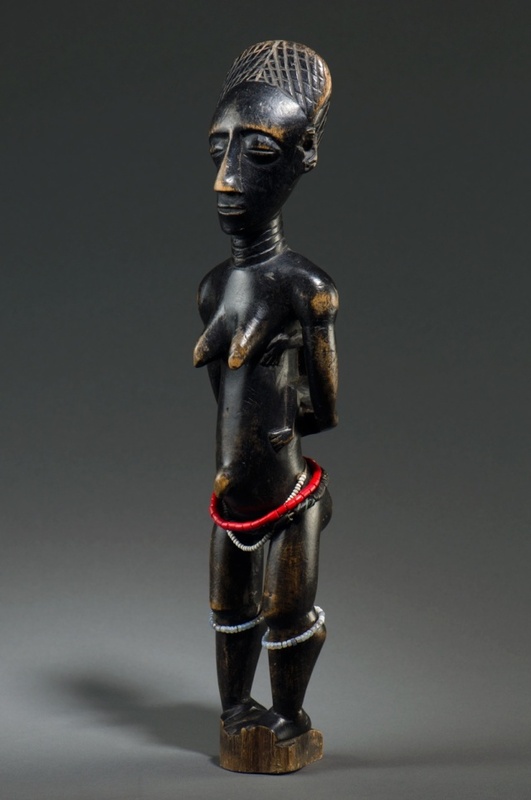 – ROBBINS and NOOTER, African Art in American Collections, Smithsonian Institution, USA, 1989. Legno con patina scura, perline. Questa scultura rappresenta una maternità. Nella cultura Agni il mondo degli spiriti è molto importante: statue e altre sculture possono comunicare con loro. Questa maternità fu probabilmente scolpita come ringraziamento per una nascita. La figura si distingue per l’alta capigliatura finemente scolpita e per la patina nera che ne riflette l’antichità. La statua possiede ancora le sue vecchie perline che erano il simbolo di bellezza fra gli Agni. Nella figura è affascinante il volto, dignitoso e fiero, che ricorda le teste commemorative d’argilla usate nei riti funerari, cosi come i volumi slanciati del corpo e l’ombelico uncinato (quasi un rimando al cordone ombelicale). Di contro, la figura posta sulla schiena – un bambino nelle fattezze ma uomo nel portamento – svolge lo sguardo all’esterno. Il tutto in un silenzioso dinamismo .